Micky Dolenz and Davy Jones on "The Tomorrow Show"
"The Tomorrow Show," hosted by Tom Snyder, was an NBC late night show that was as unlike Johnny Carson's "Tonight Show" as, well, 50 Cent is to Paul McCartney. Johnny Carson's show, which preceded Tom Snyder's show, was a gabfest featuring major and minor Hollywood actors and actresses, sports stars, starlets and musical guests. Tom Snyder's show was quite a bit different. Just as cable TV was coming into the fore, "The Tomorrow Show" was just about the only place you could hear talk on network TV about UFOs, transvestites, and drug usage. His show had guests who would never show up on the Carson show, such as the Plasmatics and John Lennon. It was outlandish, outrageous, and kind of a cross between David Susskind and public-access TV. 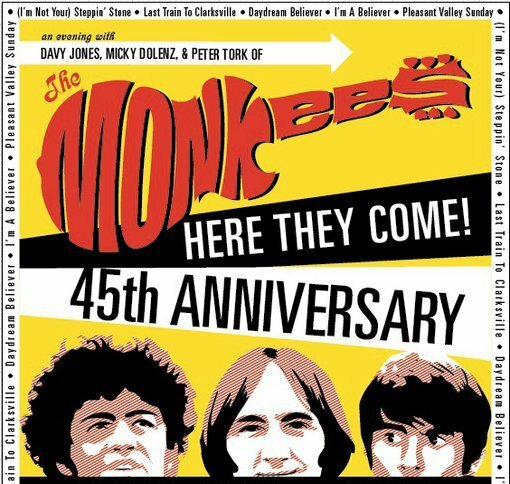 Several guests actually were on both shows at different times in their careers, and two of them, Micky Dolenz and Davy Jones, appeared on "The Tomorrow Show" on September 1, 1977. Micky and Davy were basically there to chat about their tour together at the time, directly after Dolenz, Jones, Boyce and Hart fell apart. They were supposed to be on for maybe 20 minutes or a half hour, and another guest, hawking a book, was supposed to follow. Micky and Davy basically took over the show, with Snyder as the ringleader. He had them talk about everything and anything having to do with the Monkees, and Snyder was getting a big kick out of the stories they told. His trademark guffaw was readily evident that night, and he puffed cigarette after cigarette like a chimney. At one point, the producer tried to tell Snyder that Micky and Davy were running long, and Snyder basically waved him off. Suffice it to say, the boys were on for the full hour. Here is the audio from that show, taped right off the TV I was watching the show on. I didn't have a video recorder at the time--these gizmos were around, but way too expensive for most people to own--so I had to resort to taping the audio only. I still have this nearly 34-year-old tape, and the two files you see here are the audio portion of the show, with local New York City WNBC-TV Channel 4 commercials included, taken directly from that ancient tape. The tape is pretty old, and the reason that this is in two parts is that the tape stopped in the middle at one point when I was transferring it, so I had to put the show in two files. I believe the video of this was at one time on YouTube, but I don't think it is there anymore, so this will have to suffice for now. If you never heard this before, it is a true classic, one of the best shows that Snyder ever did. And he had a ball doing it! Yes, the Monkees tour is coming to the U.S., and here are the tour dates. At most venues, tickets are not yet on sale. Sat 06/18/11 Atlantic City, NJ Borgata Hotel, Casino & Spa / Event Ctr.